A week ago one of my pre-configured eBay searches triggered on an offering for a unit crest for the Army Map Service. I see Army Map Service shoulder patches come up for auction now and then but I never saw a unit crest hit the auction site. This guy was offering just one (not the pair), but his opening bid was low – $2.50. So over the weekend I put in a top bid of $6.00 and figured surely, SURELY, nobody else in the eBay world would have an interest in something so esoteric. For days I was the only bidder and I figured I had the auction sewn up. Then yesterday I get a notice from eBay that I had been outbid. Really? Someone had put in a series of bids, obviously to find out where my high bid stood. Well, they found my top price and outbid me at $6.50. The challenge was on!. I bid $8.00 just to see where his high bid was, and found myself the top bidder again. Within a few minutes he came back and outbid me at $8.50. I went in and outbid him at $10.00 (by now you’re saying, ten bucks for a lousy unit crest?!). He shot back and outbid me at $10.50 (the other guy may have been persistent, but he was cheap). I went in and out bid him at $12.00. By now it wasn’t about the price. It was this guy trying to steal MY unit crest out from under me. Don’t laugh, eBay has made millions leveraging this weakness in the human psyche. The other guy comes back and out bids me at $12.50. I figure it’s time to execute the nuclear option. I go in and place a top bid of $20.00. He comes back in and inches his bids up fifty cents at at time looking for my upper limit, but he reaches his at the $16.50 point. Auction ends. I’m the proud owner of a $2.50 unit crest that cost me $16.50 (plus shipping). Yesterday the folks over at Wired posted a really neat article on the Soviet Union’s military mapping program during the Cold War titled Inside the Secret World of Russia’s Cold War Mapmakers. The author seems to imply that the Russians were better at this sort of thing than the US was. Oh pish-posh. I spent most of my 23 year career in the US Army doing this very same thing – compiling what we called terrain intelligence (now called geospatial intelligence) and placing it onto annotated maps or, more commonly, map overlays. This was GIS long before there was GIS. But while the former Soviets have done a wholesale dump of their formerly classified terrain intelligence data onto the commercial market to make a few bucks, the US and NATO studies are likely still classified and remain under lock and key. The Soviets and the US (and our NATO partners like the British and Germans) approached the task in the same way – use every available source, from readily available tourist maps to ‘technical intelligence’ (aka, spy satellites) and on-the-ground observers (aka, spies) to compile extremely detailed map-based studies. In my field we tended to concentrate on factors that would directly impact Army ground operations, things like soil conditions, vegetation types, ground slope, road and bridge capacities, building densities in cities and towns, airport and landing zone data, river and stream conditions and much more. What made the Soviet’s job so much easier is that the West’s open societies gave them virtually unrestricted access to accurate, detailed mapping data compiled for civilian use. A Soviet military attache assigned to their embassy in Washington DC could simply walk out of his embassy compound and stroll a few blocks to one of several well stocked map stores in the US capital. This included, I’m sure, the excellent map holdings over at the National Geographic Society. The US Geological Survey’s map store was just a short drive away in Reston, VA and I’m sure the Soviet Embassy was one of its best customers. This military attache’s counterpart in the US Embassy in Moscow couldn’t do the same thing. The Soviets simply didn’t sell or give away maps of their territory. Most mapping data, even the most innocuous, was considered classified. That meant we had to get the data some other way. Of course I’m sure we did our share of bribing, cajoling, blackmailing and stealing to get copies of their maps (remember now, this was a cold war; we weren’t playing patty-cake), but we also very quickly developed out ‘technical intelligence’ capabilities – again, spy satellites – that allowed us to accurately map vast areas of the Soviet Union and her client states from space. It is said that the Defense Mapping Agency was the single biggest consumer of spy satellite imagery during the Cold War. So dear reader, rest assured that while the Soviets were spying on us to develop highly accurate map and geographic intelligence data we were doing the exact same thing to them. We just haven’t seen the need to sell our intelligence on the open market to make a fast buck. It’s rare that I publish blog posts back-to-back, but this new tool from the USGS is so impressive that it deserves to be showcased as soon as possible. I was chasing a link on the USGS site that was provided by a colleague in relation to my blog post yesterday on the Perrysburg Plat Map when I stumbled on a new product titled the USGS TopoView, or ‘topoView’ (note the lowercase ‘t’) depending on where you look on the site. We’ll use the more grammatically correct TopoView. I’m not sure if this is a replacement for the USGS Historical Topographic Map Explorer released just last year or if it’s a complimentary app. The Historical Topographic Map Explorer seems more suited to map visualization on desktop systems while the TopoView app appears to be more of a data access tool, and one that is designed to run on mobile devices (although I haven’t tested it on a tablet – yet). The site runs slow so I’m guessing they have it running on a development server while they tweak the application, but when it runs well it’s a fascinating way to find, explore and even download USGS products. I dare say, this is one web application that might just force me to go buy a plotter so I can print out my own full-scale historical map sheets. Next, go play. Just click the image below to launch TopoView. And don’t blame me if your boss gripes about all the time you are spending on the computer. As I’ve mentioned in earlier blog posts, you can find interesting map in the most unusual of places. Earlier this month I was up in northwestern Ohio visiting with my father and decided to take a few hours and check out the local history. I found myself in the delightful town of Perrysburg, right across the Maumee River from my hometown of Maumee. Perrysburg and Maumee ‘grew up’ together during the 1800’s and for much of their history were economic rivals, vying for the lucrative trade that moved up and down the river. In the end both lost out to Toledo, situated a few miles downriver where the Maumee empties into Lake Erie. Perrysburg became what can best be described as bucolic, a sleepy little town that time and development passed by until one day about 40 years ago folks recognized that the town had a charm and a unique history unsullied by commercial development and tract housing. Suddenly Perrysburg became a trendy place to live and visit. The city worked hard to retain the unique flavor of the historic downtown, and they’ve done a great job. The town was first established in 1812 on a bluff overlooking the Maumee River. In 1816 two US government General Land Office surveyors, Joseph Wampler and William Brookfield, laid out the town street pattern. Soon after the residents decided to change the town name to Perrysburgh to commemorate Commodore Oliver Hazard Perry’s victory over British naval forces at the Battle of Lake Erie at Put-In-Bay. The ‘h’ was eventually dropped from the Perrysburg town name at some point lost to history. Wampler and Brookfield appear to be some of the first government surveyors sent into what was known as the Northwest Territory after the War of 1812 to conduct official land surveys using the Public Land Survey System otherwise known as the township & range layout. The federal government was eager to get this land surveyed, platted and sold. At the time land sales were a major source of revenue for the cash strapped US treasury, plus the government wanted to encourage settlement in the area to solidify American claims to territory ceded by the British and Native Americans under the Treaty of Ghent which ended the War of 1812. Both Wampler and Brookfield were very competent surveyors and there are records of their work in both the National Archives and the state archives of Indiana, Ohio and Michigan. 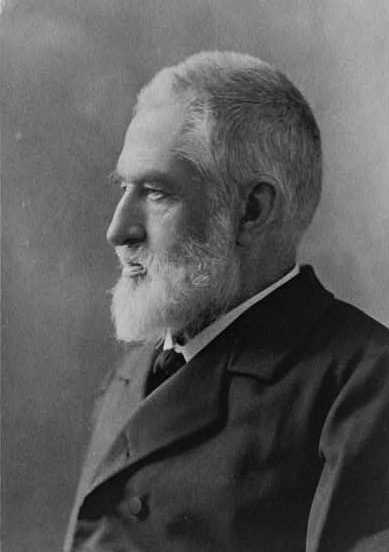 Wampler is cited by several sources for his efforts in correcting the sloppy work of other surveyors, particularly his work to establish two initial points for the Michigan surveys. Brookfield seems to have headed west from Perrysburg and eventually became a surveyor and later circuit court judge in St. Joseph County, Indiana. What we don’t know is what induced these two gentlemen to lay out, or plat, the town of Perrysburg. Platting towns and settlements was not something surveyors in the employ of the GLO (General Land Office) did. My guess is that Wampler and Brookfield got specific instructions from the GLO to execute the survey after the town’s leading citizens petitioned their representatives back in Washington, D.C. How rare was it to have GLO surveyors plat a town? Well, there’s only four cities or towns in the United States that were platted by surveyors directly employed by the federal government. Perrysburg is one, Washington D.C., Croghansville (Fremont) Ohio and Shawneetown in the Illinois Territory are the others. 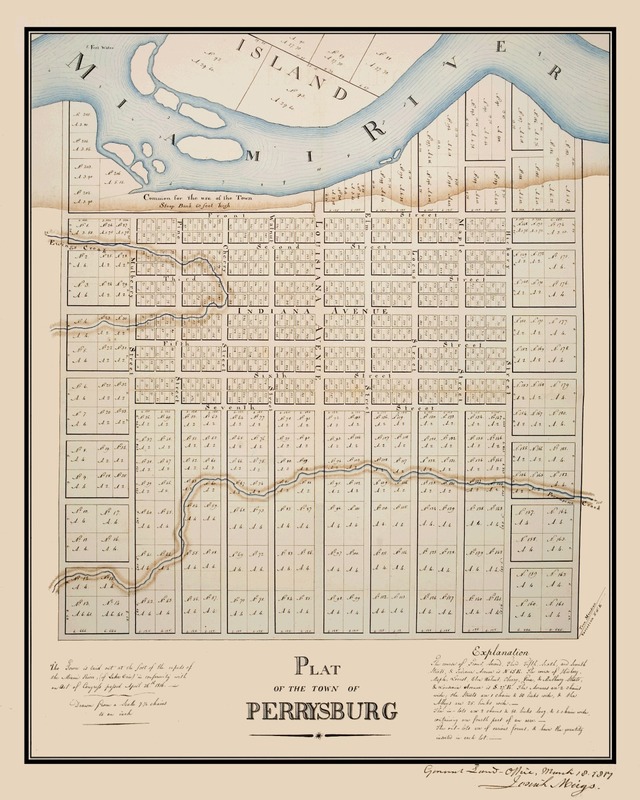 The layout and street pattern of Perrysburg as shown in the 1816 plat is still visible today on maps and aerial images. In fact, little has changed. 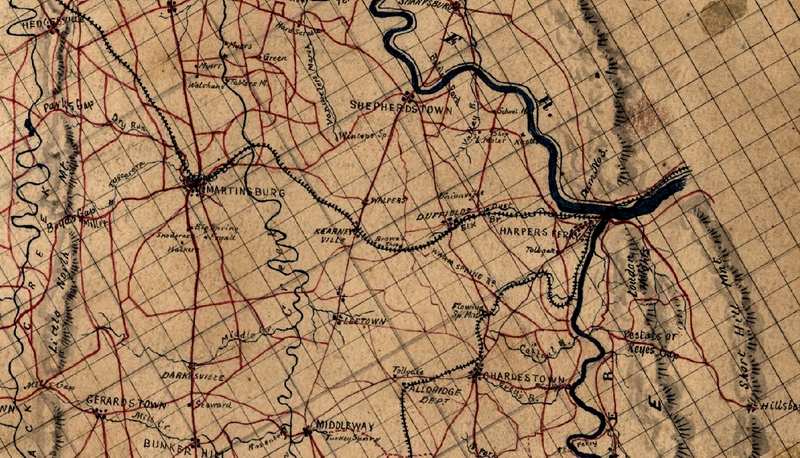 Some lots have been combined, particularly along Louisiana Avenue, which became Perrysburg’s main street and commercial district, and some rail lines and secondary roads have intruded. But for the most part downtown Perrysburg is as Wampler and Brookfield laid it out almost 200 years ago. 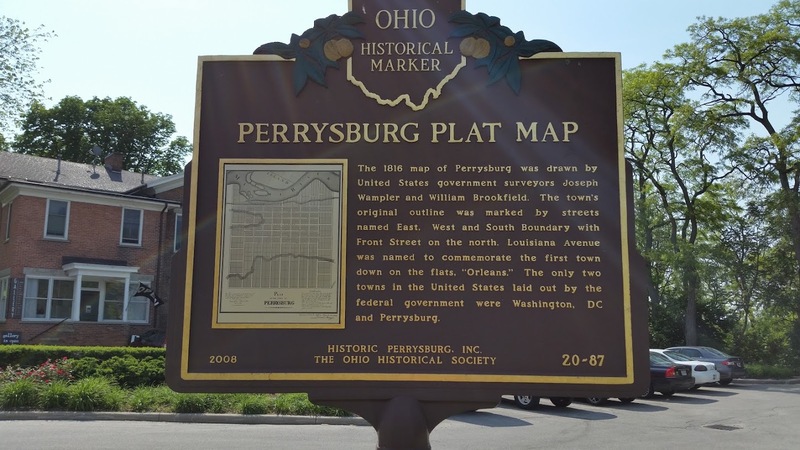 To see just how little has changed in the old section of Perrysburg click on the image below to launch a web map that lets you compare 1816 to 2015. Have fun! I spent my teenage years growing up in Maumee, Ohio, on the banks of the Maumee River just south of Toledo. Maumee is a lovely little town that has changed little since my family moved there in the early 1970s. The northwest Ohio region and the Maumee River played an important role in the early history of the United States. The river’s direct connection to the west end of Lake Erie made it a key transportation and trade route into what at the time was referred to as the Northwest Territories. The British had long considered the territory as Indian land and only maintained military and small trading outposts in the region. White settlement was strongly discouraged. However, at the close of the American Revolution the British ceded control of the region to the Americans (although they took their sweet time getting out of town) and European settlers lost no time spilling over the Appalachians and on into the new territories. In 1787 Congress passed the Northwest Ordinance of 1787 that formally opened the region to settlement (and not coincidentally established the concept of public land sales as a way for the cash starved federal government to generate some revenue). Very quickly Lake Erie and it’s major tributaries became critical territory and conflicts frequently flared up as American, British and Indian interests intersected and collided in what was effectively the new American frontier. 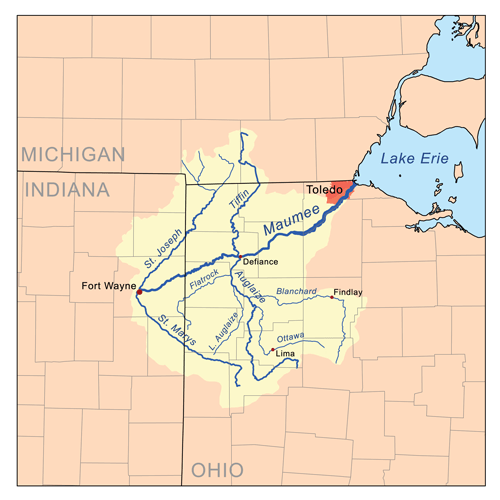 For thousands of years the Native Americans had used the Maumee River as a major trade route. The European powers and the new American republic recognized the river as the western gateway to the rich lands of the Ohio Country interior (today’s western Ohio, Indiana and lower Michigan). All sides considered control of the waterway a strategic necessity. After the close of the American Revolution the British never really vacated the region. They maintained a number of outposts in places such as Detroit (yes, that Detroit) and Fort Miami near the city of Maumee, conducted a regular business of illegal trade with the local Indians and did a lucrative side business in fomenting anti-American sentiment among the tribes of the Western Confederacy. This all erupted into the Northwest Indian War, culminating in 1794 with the Battle of Fallen Timbers just a few miles away from Fort Miami. The American general, ‘Mad’ Anthony Wayne decisively defeated the tribes of the Western Confederacy on a piece of terrain marked by a tangle of trees that had been blown down during a violent storm. 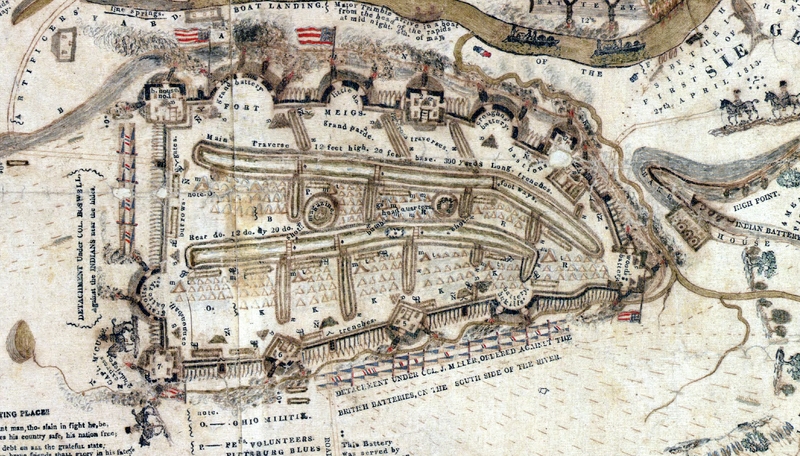 The Indians retreated towards what they thought would be refuge with the British garrison at Fort Miami, but the British commander refused to open the stockade. The surviving Indians scattered and the war was over. Not long after the British abandoned the fort and marched north into Canada. Nineteen years later the British are back. It’s 1813 and the War of 1812 is raging. The Lake Erie basin is a critical theater of operations. The Americans have decided to invade lower Canada and move to establish a fort and supply depot on the Maumee River to support the invasion. The commander, General William Henry Harrison, selects a spot on a bluff on the south side of the river that overlooks the first set of rapids. These rapids serve as a natural choke point for any boats, barges, canoes or naval vessels trying to move upstream from Lake Erie. It is an ideally situated fort, and whoever controls it also controls all movement on the river. The British want it, and want it bad. The fort was named Fort Meigs after Ohio governor Return J. Meigs. The fort was originally garrisoned with a few Regular Army troops and Ohio militia. Construction started in February 1813 and just two months later the fort was placed under siege by British forces that had marched down out of Canada and re-occupied the old Fort Miami stockade. Forts Meigs and Miami were located a mere two miles from each other, on opposite sides of the river. 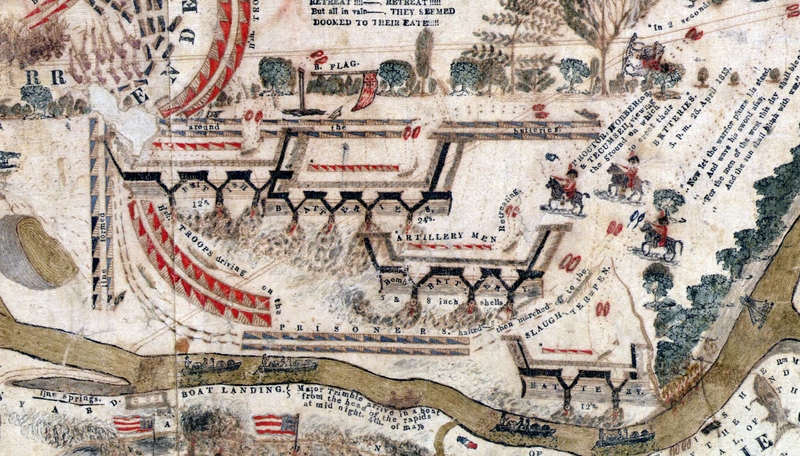 Part of the record of the siege is a vividly detailed battle map drawn up by an officer of the Kentucky Militia, Captain William Sebree. Seabree was the commander of a company of infantry that drew most members from around Campbell County, Kentucky. The company was designated the 8th Company of the 10th Regiment, Kentucky Light Infantry that was commanded by Lt. Col. William Boswell. 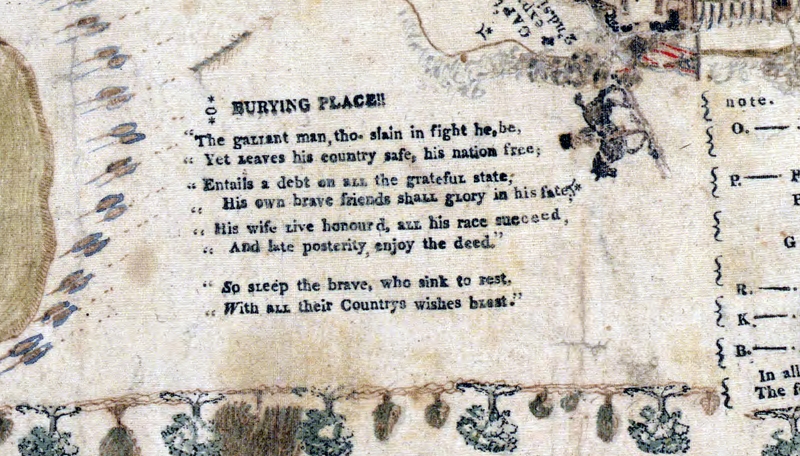 Indications are that Sebree compiled his map after returning to Kentucky at the end of the war. However, the amount of detail in the map – both the cartographic representation of natural and man made features and the written depictions of the flow of the skirmishes and battles – makes it clear that Captain Sebree was working from a rich collection of original material. Certainly he kept a detailed journal while in command and also had copies of his company’s daily logs and reports. He likely also had access to the regimental papers and solicited input from other unit commanders and common soldiers. 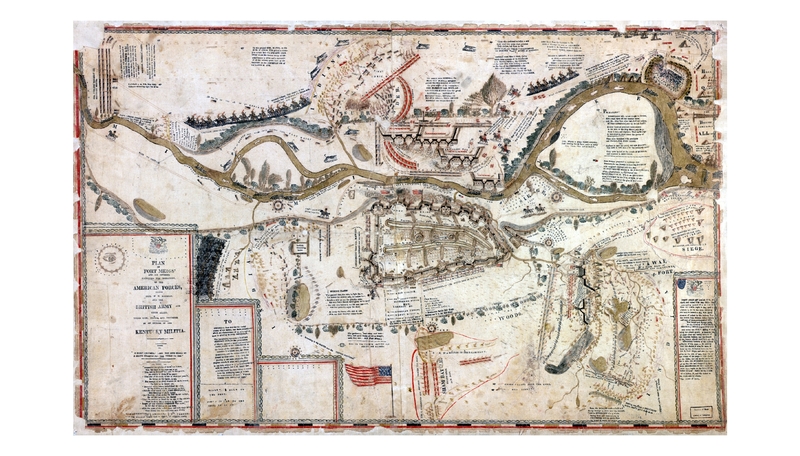 What emerged was less an authoritative battle map and more a piece of patriotic folk art that still manages to convey in some detail the ebb and flow of battle. There is no north arrow or compass rose (on this map, north is to the right). But there is perhaps the more important (to Sebree) ‘all seeing eye’ with the phrase annuit coeptis (Providence favors this endeavor). This symbol is taken from the Great Seal of the United States, adopted around 1782, and was in common use in the early 19th century. However, it may also indicate that Captain Sebree was a Mason, and the first authorized Masonic Lodge in northwestern Ohio was organized by the American officers stationed at Fort Meigs in 1813. It is highly likely that Captain Sebree was a Mason (as were many officers of his time) and a member of this lodge. This is all speculation on my part, but I think the threads are there. The map appears to be a commercial product. It’s a mix of set type and what looks to be woodcut printing. My guess is that Captain Sebree had these printed for commercial sale to a public eager for a memento of America’s glorious victory over the British and their Indian allies, or he sold copies by subscription. However, I know of only one existing copy that is in the Library of Congress map collection. It seems Captain Sebree was an adventurous fellow. He was born in Virginia in 1776, migrated to Kentucky and settled in Boone County, studied law after the war and eventually moved to Pensacola, Florida where he was appointed the federal marshall for the territory of West Florida. He died in 1827 of yellow fever and is buried in Saint Michael’s Cemetery in Pensacola. Dan Wilkins runs a great blog about the War of 1812 and has a section devoted to Fort Meigs and the events that took place there. I lived in Maumee for almost 10 years and have a deep interest in the history of the fort and the battles that took place around it. But until I read Dan’s blog I had no idea that remnants of the original British canon pits dug during the first siege were still visible in the old Fort Meigs Cemetery just east of the fort. 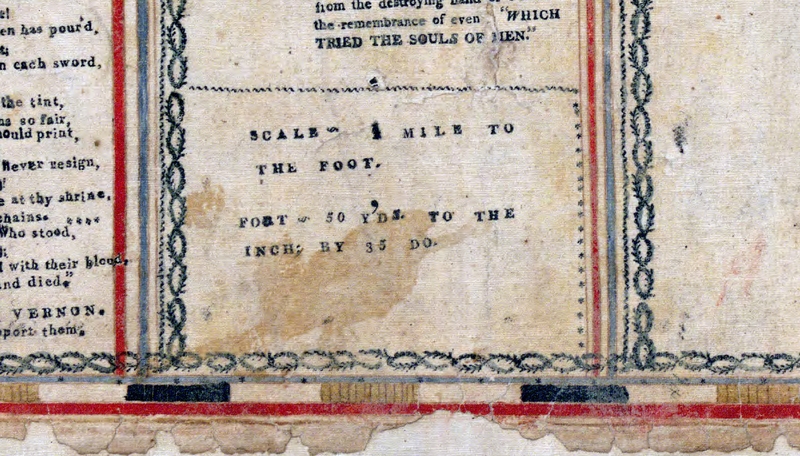 If you have any interest in the War of 1812, and in particular the events that took place in the Northwest Territory, I recommend you spend some time taking a look at Dan’s writings. A few days ago my old friend Jim, unreconstructed Southerner (from South Jersey) and full-time VMI (Virginia Military Institute) alumni, let me know that there’s a new book out on VMI’s most well known professor, Thomas ‘Stonewall’ Jackson. It’s titled ‘Rebel Yell: The Violence, Passion and Redemption of Stonewall Jackson’ by S. C. Gwynne. Jim read an on-line review of the book and commented on how the article mentions Jackson’s keen ability to ‘read the battlefield’. In previous blog posts I’ve discussed how great military tacticians and strategists have what seems like a God-given ability to read the ground. The ability to look at a particular battle space and know intuitively how forces will array either in the attack or the defense is the mark of a great battlefield commander. Patton had that ability. So did Napoleon, Robert E. Lee and Erwin Rommel. Stonewall Jackson was a master of the art, and perhaps one of the best operational-level commanders ever to take to the battlefield. Jackson was like a mighty sword in Robert E. Lee’s right hand, and the best thing to happen to the Union Army was Jackson’s death on May 10th, 1863. Had Jackson still been alive and in command of his Second Corps of the Army of Northern Virginia in July of 1863 Gettysburg would likely have turned out very differently. As an operational commander Jackson realized he couldn’t take it all in from the saddle of his horse. He understood that he needed good terrain intelligence in the form of accurate and detailed maps. Jackson was fortunate to gain the services of a talented topographer named Jedediah ‘Jed’ Hotchkiss. Hotchkiss was a transplanted New Yorker who was running a school in the Shenadoah Valley when the Civil War broke out. He was also a self-taught topographer, geologist and engineer. Hotchkiss offered his services to the Confederate Army and soon found himself serving on Jackson’s staff as his chief topographer and reaching the rank of Major. 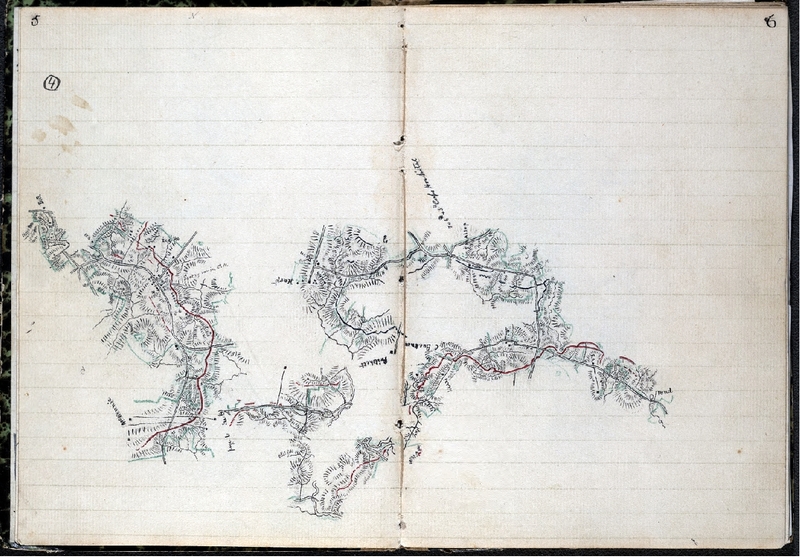 Hotchkiss had a deep knowledge the Shenandoah Valley and used that knowledge to produce extremely detailed and comprehensive maps to support Jackson’s movements. But Hotckiss didn’t just make maps. Jackson so trusted his topographer’s knowledge of the ground and tactical abilities that he often had Hotchkiss lead columns to their objectives. 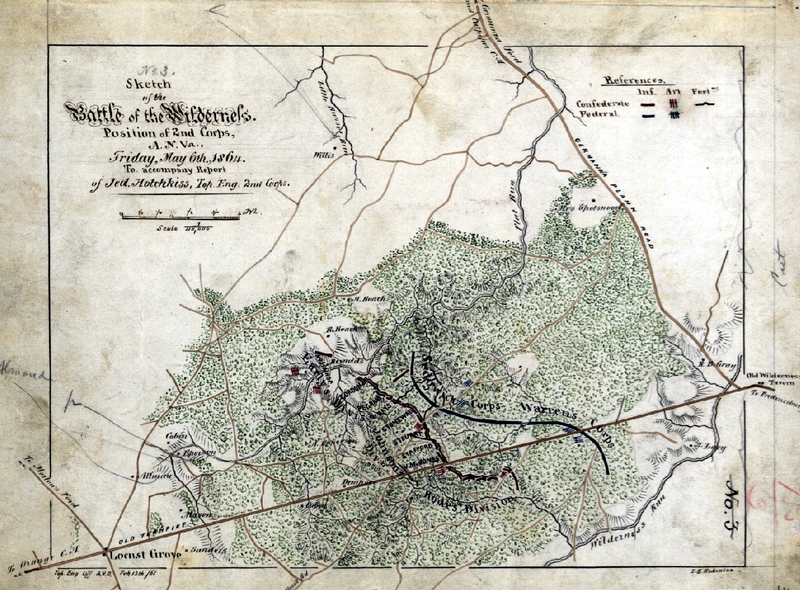 Hotchkiss’ mapping and leadership skills quickly came to the attention of Robert E. Lee and copies of his maps were used extensively by Lee’s headquarters staff. In fact, it was Hotchkiss who reported the news of General Jackson’s wounding at Chancellorsville to Lee. While Hotchkiss remained with the Second Corps staff until the end of the war he was often called upon by Lee to conduct specialized mapping and reconnaissance missions in support of larger Army of Northern Virginia operations. At the war’s end Hotchkiss reputation was so well known that General Grant allowed him to keep possession of his maps. After the war Hotckiss’ maps were used extensively by the Federal Government when preparing the Official Record of the Civil War. The Library of Congress acquired most of Hotchkiss’ map collection in 1948 and it is now one of the centerpieces of the Library’s Civil War map collection. In 1948 the Library published an excellent short biography of Hotckiss’ wartime mapping activities. 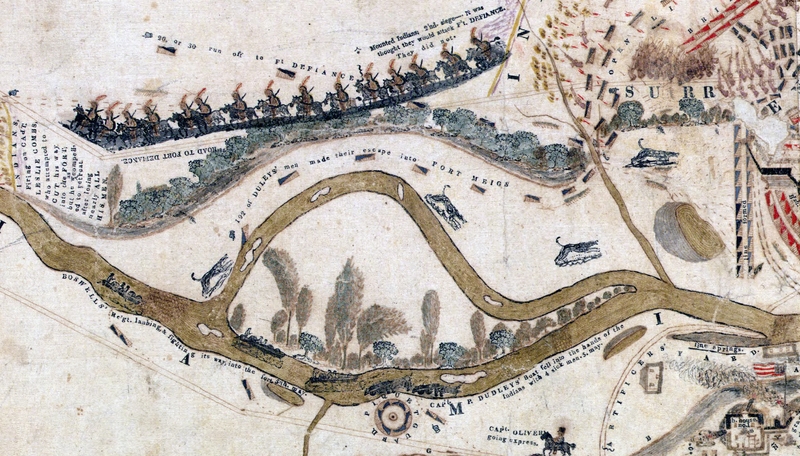 His maps are true works of art and represent some of the finest battlefield cartography to emerge from the Civil War. After the war Hotchkiss returned to his beloved Shenandoah Valley and continued his teaching and engineering professions. He became a successful businessman and an honored member of the Staunton, Virginia community. He died in Staunton in 1899. On his death his Civil War map collection was donated to the Handley Regional Library in Winchester, Virginia and in 1948 was moved to the Library of Congress. The Geography and Map Division of the Library of Congress has made most of the Hotchkiss collection available for viewing on-line (just click this link). Spending some time on the site will give you an appreciation for the talent and contributions of this important wartime topographer. I spent most of my military career serving either as a Topographic Officer (21C) or a Terrain Analysis Warrant Officer (215D) in the Army Corps of Engineers. It was clear throughout most of my career that the Engineer branch really didn’t know what to do with us. Longstanding US Army doctrine said that the Corps of Engineers ‘owned’ the topographic and terrain analysis (military geography) discipline, but owning and effectively managing are two different things. The field was so small and specialized that the Engineers tried to manage it by exception, as though we all carried a pox that would infect ‘real’ Engineers if we came too close. However, this was not always the case. For several decades in the first half of the 19th century two military engineer organizations ran parallel to each other in the US Army. One organization was filled with officers with mostly limited engineering backgrounds. This group was detailed to handle general engineering support to field units, tackling simple engineering tasks like improvements to local fortifications, managing the construction of tracks and trails in support of military movement and doing local reconnaissance and field sketching in support of military operations. These were the regular Engineer forces assigned to the field Army. The other group was filled with the cream of the graduating classes from West Point and some of the top graduates of the few engineering schools operating in the US the time. This group handled most of the civil works improvement projects along the coastlines and interior waterways and mapped the new western territories and opened them for exploration and settlement. This last group truly was the civil engineering force for the new nation and was known as the Corps of Topographical Engineers. Uniform button design for officers assigned to the Corps of Topographical Engineers. 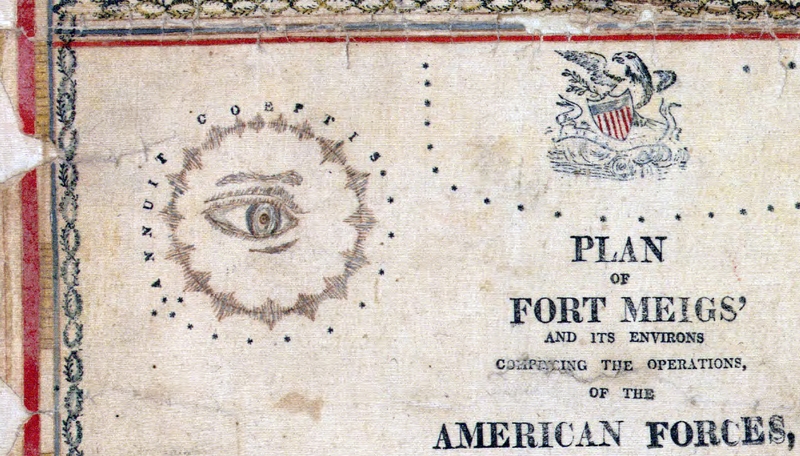 From roughly 1812 to 1863 the Corps of Topographical Engineers operated as an independent organization, sometimes as a separate branch within the War Department, sometimes as a wholly autonomous section within the Army Engineers. The ‘Corps’ was little more than a roster of officers detailed to the Topographical Engineer branch. There were no enlisted personnel assigned and Topographical Engineers were usually dependent on local Army commanders to provide the needed manpower for projects. What the Corps of Topographical Engineers did have was some of the best civil engineering minds in the nation. At a time when trained engineering expertise was hard to come by – civil engineering as a defined discipline wouldn’t emerge until well after the Civil War – the Army and Congress often turned to the Corps of Topographical Engineers to handle most of the early public works planning and management. Topographical Engineers explored and mapped the Great Lakes region, managed canal construction and waterways improvements and even surveyed and planned lighthouse locations. In the 1850s, when the federal government needed to have the lands acquired from Mexico and the newly incorporated State of Texas explored and mapped, they sent in the Topographical Engineers. When Congress needed to know if there were suitable routes through the Rocky Mountains for the planned transcontinental railroad they sent the Topographical Engineers to have a look. Once the Oregon Territory dispute was settled with England the Topographical Engineers moved in to map the rugged interiors of what is today Oregon, Washington and Northern California. In 1863 the Army folded the Corps of Topographical Engineers into the regular Corps of Engineers and a proud organization that provided immeasurable service to the nation disappeared. I guess it was inevitable since there was a desperate need for trained Engineer officers to support the Federal armies during the Civil War, and there was growing overlap in the roles of the two organizations. The Corps of Engineers’ love affair with it’s mapping and surveying mission waxed and waned over the next 150 years. Engineer officers still found themselves assigned to important topographic missions as America settled it’s western territories, rushed to map its newly acquired territories after the Spanish-American War, threw armies across the seas in World Wars One and Two and stared down the Soviets during the Cold War. I believe the peak of the Corps of Engineers interest in and dedication to its topographic mission came with the establishment of the Army Map Service in WWII. The Engineers realized they had to get damned serious damned fast about this mapping thing and developed the doctrine, equipment, techniques and technology necessary to produce maps and related products to support a world-wide war effort. This effort continued well into the Cold War, and it was the Army Map Service (and later the Army Topographic Command) that gave us groundbreaking developments such as the Universal Transverse Mercator grid system, the Military Grid Reference System and early research work on an earth-centered geoid that ultimately became WGS 84. As the Cold War wound down the Corps of Engineers interest in its mapping mission wound down too. 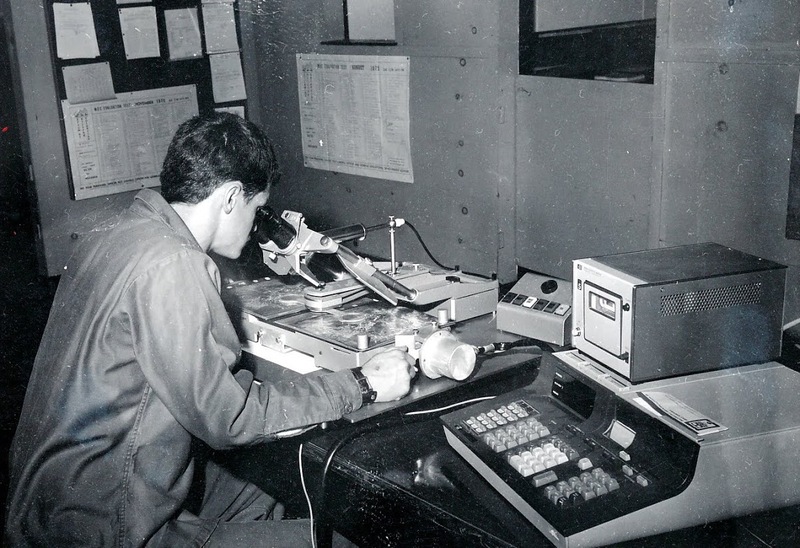 As more and more map production was pushed to the national level (to the Defense Mapping Agency, which became the National Imagery and Mapping Agency, which became the National Geospatial-Intelligence Agency) and mapping systems moved from paper to digital and became embedded in battlefield command and control systems, the Engineers seemed on a headlong march to shed their traditional topographic role. Inevitable? Perhaps. Wise? I don’t think so. Topographic knowledge is the foundation of military expertise. Great generals like Napoleon, Lee and Grant, and Patton all talked about the necessity of being able to visualize the battlefield, the ability to identify ‘good ground’. Someone will always have to paint the battlefield picture for the generals, and that’s the job of the Topographic Engineer. Although the Corps of Topographical Engineers has faded into history they are not forgotten. There is a small but active group that keeps the history of the early Topographical Engineers alive through research and reenactments. 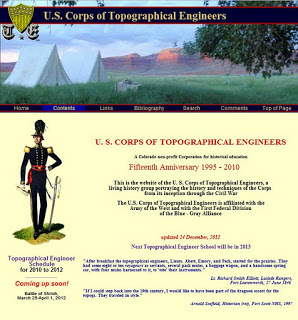 They are the U.S Corps of Topographical Engineers. Their website is a great resource for anyone interested American history and the story of how America grew in the early 19th century. So here’s to the Corps! To a group of dedicated Topographical Engineers that explored, mapped and helped build this great land. Ladies and gentlemen raise your glasses. Yesterday on Facebook an old friend, Kurt Schwoppe, provided a link to a new US Geological Survey – ESRI joint project, the USGS Historical Topographic Map Explorer. At first I thought, “Meh, I think I’ve seen this before” and was about to move on, but something told me to click the link. When I came up for air about a half hour later I was entranced. The USGS and ESRI have done a marvelous job of integrating historical map coverage with modern web map technology. The USGS has digitized and georeferenced their entire collection of historical toographic maps covering the entire country (about 178,000 individual maps). The coverage in many areas goes back to the late 1800’s, and users can easily select maps by date and scale, overlay them, adjust visibility to ‘blend’ the views and even download the historical maps directly from the interface. By default the website opens focused on New Orleans, as good a place as any to begin exploring the historical maps of a city. Clicking the map links in the timeline in the bottom window will add them to the ‘stack’ on the left side of the web page. From there you can adjust the visibility of each map using a convenient slider to blend the map image in and out, allowing fast and easy comparison with any of the other maps in the stack. First, while there was a steady increase in both the density of content and the variety of information contained in maps as the USGS progressed through the 20th century, there was, sadly, a steady erosion in the practice of cartography as an artistic medium. I understand the USGS’s job isn’t to make art, but visual appeal is something that draws the user to the map. The hand drawn cartography applied to the USGS maps of the late 19th and early 20th century is a wonder to behold. By comparison the current US Topo series maps have all the visual appeal of a rusted out Yugo. Next, there’s a clear improvement in the spatial accuracy and information content between maps prepared in the late 19th and early 20th centuries and maps prepared in the 1930’s and later. This is due to the adoption of aerial photography and stereo compilation production methods starting in the 1930s. By using stereo aerial photography as a map compilation base the USGS dramatically speeded up map production while simultaneously improving map accuracy and content. To sum it all up I’ll just say that the USGS Historical Topographic Map Explorer website is the best use of my tax dollars that I’ve seen in a long, long time! Time for some polite applause. 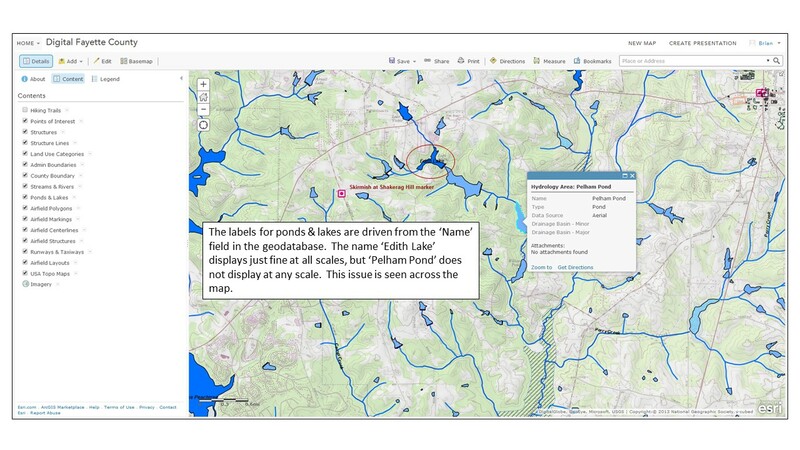 Yesterday ESRI released an update to ArcGIS Online. This is a significant update because it adds a number of enhancements that the user community has been requesting for quite some time. The first enhancement we’ll talk about is labeling. Labeling of hosted feature services has to be the #1 update requested by (paying) customers since ArcGIS Online launched in 2012. A hosted feature service is a type of map service that is stored (or hosted) in ESRI’s ArcGIS Online cloud. Before yesterday the only way to get labels into your ArcGIS Online web maps was to stage your data as a dynamic map service on your own internal servers running ArcGIS for Server or create a cached map (tiled) map service. Both of these options are expensive in cost and overhead. 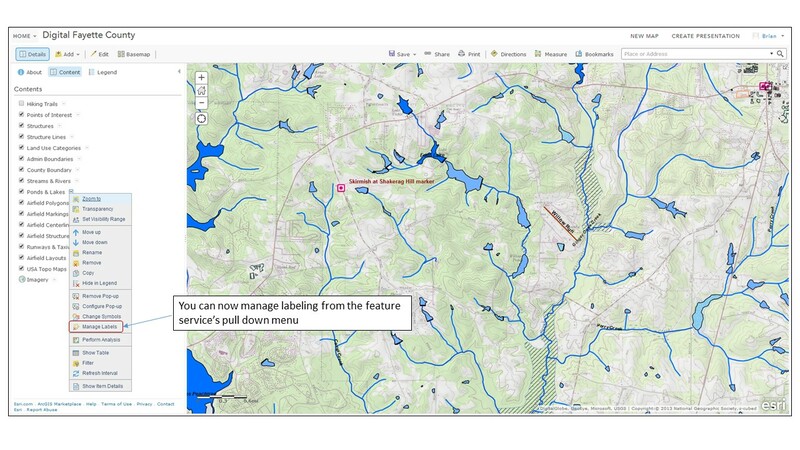 With yesterday’s update you can generate labeling against hosted feature services from within the web map interface. The labeling options are fairly limited. The user gets to choose label placement (above, below or on the line. ), which geodatabase field(s) will drive the label name and some basic text formatting options. The line/polyline labeling works well, but there appears to be some major issues with polyogn labels not displaying, even in areas where there are no competing labeling issues. Another critical update is a new search function. 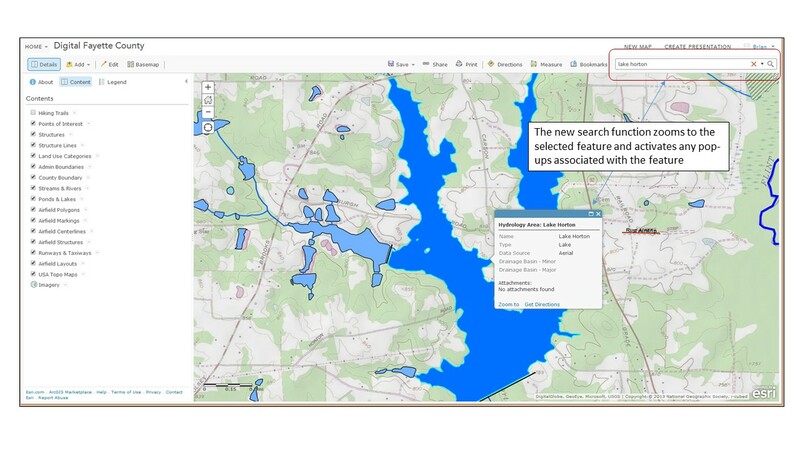 ESRI has offered filtering against map layers for some time, and that’s a type of search, but that functionality is intended mainly to generate new focused map layers. 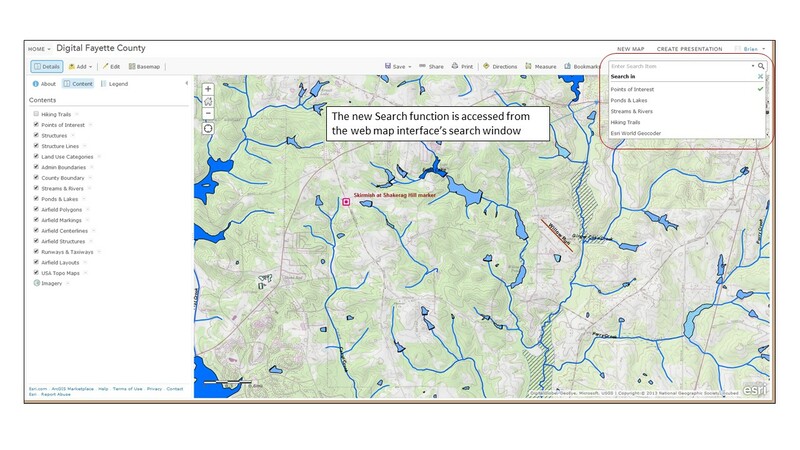 For this new search functionality ESRI decided to embed the feature in the web map interface rather than access it from a specific map layer. At first I was a bit confused as to what ESRI was trying to achieve with this new feature – I expected any new search function to be driven from the map interface. However, once I played with it I see ESRI’s logic, and I like how they implemented it. The search criteria is first set up on the web map’s Properties page. 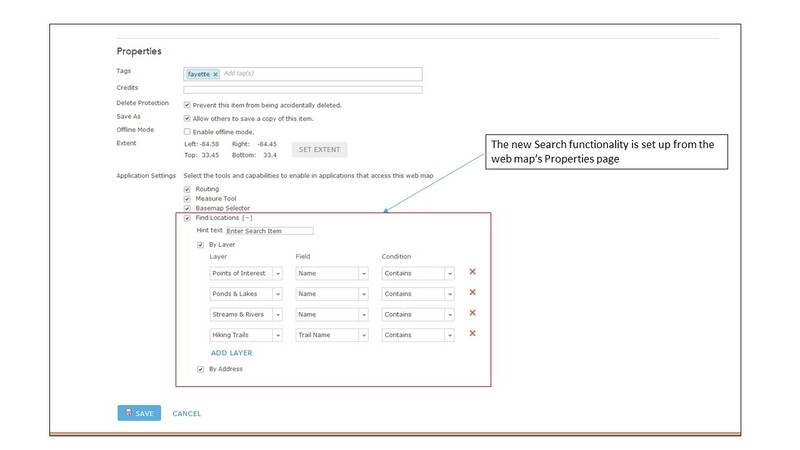 Once the search criteria are set up on the Properties page the user can access the functionality from the web map’s search window. The Search function will zoom to the selected feature and activate associated pop-ups. While this is a very simple search functionality it works well and I like how it was implemented. This is just a first and fast look at the new features. There’s a lot of good stuff in here and it’ll take me some time to play with it all. In a few weeks I’ll be out at the annual ESRI International User Conference and I’m sure these new features will get a lot of coverage during the Plenary sessions. Something to look forward to! That would be, keep your big fat fingers off the first surface mirrors. I buy a fair number of old optical instruments related to topography, surveying and navigation for my collection. Everything from Brunton pocket transits to theodolites to sextants. The majority of these instruments rely on first surface mirrors to establish a precise optical path. A first surface mirror, or front surface mirror, is a mirror where the reflective coating (silvering) is applied on top of the glass instead of behind the glass as on standard surface mirrors. When I was going through the Defense Mapping School for various courses in the 1980s I got training on systems like the Analytical Photogrammetric Positioning System (APPS). The APPS consisted of a large stereosope connected to an X-Y controller and an early desktop computer. The APPS used large first surface mirrors to provide a highly precise view of specially processed film positive stereo images. The georeferenced images allowed the operator to determine the precise location (x, y & z) of features in the images – road intersections, bridges, buildings, runways, etc. In its time the APPS was a revolutionary system, and it relied on first surface mirrors to bring the stereo images to the operators eyes. Whatever we were being trained on, whether it was the APPS, or reflecting stereoscopes, or any instrument that used first surface mirrors the instructors warned us repeatedly – “keep your big fat fingers away from the first surface mirrors!” And for good reason. Because the reflective coating is placed on top of the glass the reflective surface is unprotected and exposed to the elements. The oil and sweat in the human hand contains acids that can permanently etch these exposed reflective surfaces. Even things like the tar and nicotine from cigarette smoke, the oil mist from small pumps and motors, and a whole host of other environmental pollutants will attack the reflective surface of these mirrors. Their only defense is the care exercised by the user. Whenever I check out at an instrument like a stereoscope to add to my collection the first thing I look at is the mirrors. The condition of the mirrors is a direct indication of the care the instrument has received and the conditions it was stored under. Dirty and/or tarnished mirrors usually indicate the instrument was not well cared for or stored properly. If the mirrors are in bad shape it’s a good bet that the other components, like the optics, are in bad shape too. Bad mirrors = a significantly lower offering price. 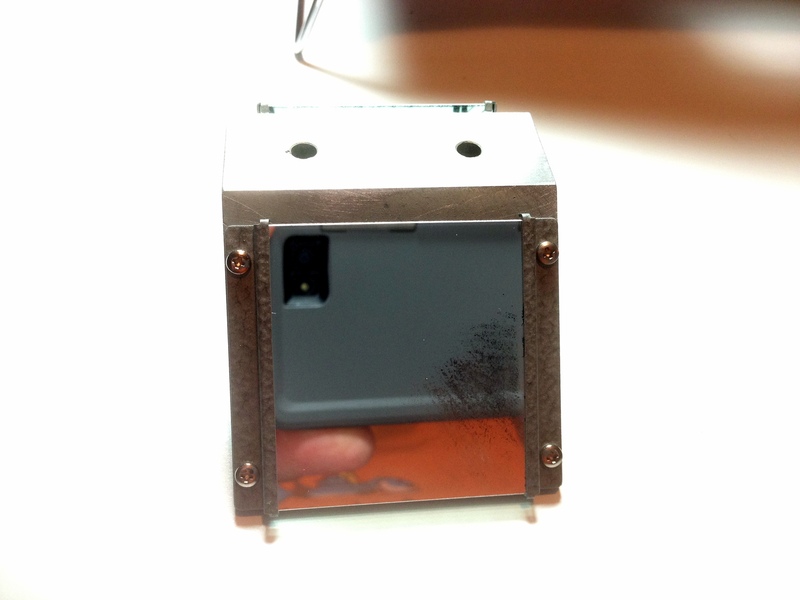 The reason is simple – first surface mirrors are hard to get and expensive. 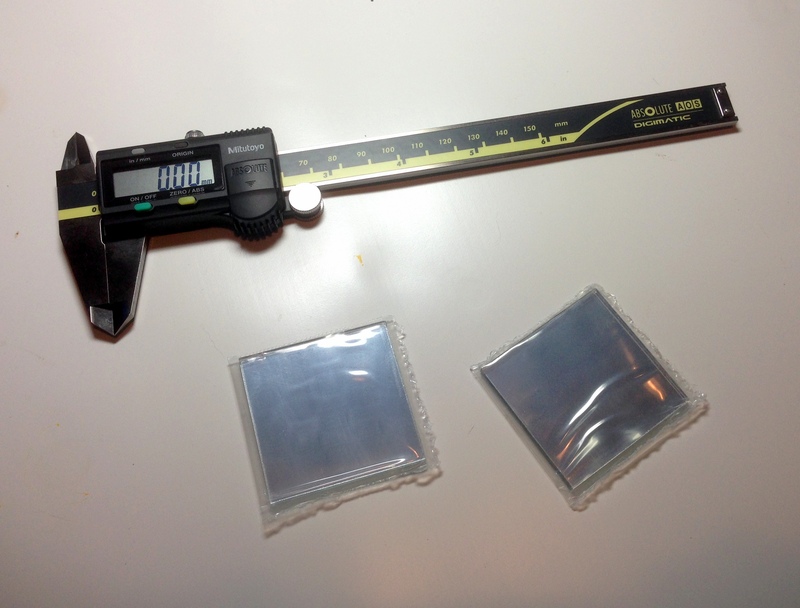 A new set of primary mirrors for a stereoscope can easily exceed $100. If someone is asking a couple of hundred dollars for a stereoscope you don’t want to be putting another hundred bucks or so into a new set of mirrors. But sometimes the asking price is so good that you take a chance, and that’s what I did with the stereoscope we’ll take a look at today. Several months back I spotted a nice little Sokkisha MS-16 stereoscope for sale on eBay. The seller did a good job of photographing the stereoscope from a number of perspectives, including a clear shot of the primary mirrors. Overall the instrument looked like it was in very good condition. I tossed out a low bid and was surprised when I won. When the stereoscope arrived I gave it a quick inspection and was pleased to see it really was in good condition, including the primary mirrors. I slid a set of stereo images underneath for a check of the optics and immediately noted that the right side was a little cloudy. At first I suspected a dirty lens, but further investigation revealed that one of the small secondary mirrors was ‘dirty’. A gentile swipe with some alcohol didn’t improve the situation so I removed the lens bridge for a closer look. I was disappointed to see that the right mirror wasn’t dirty, it was badly scratched. 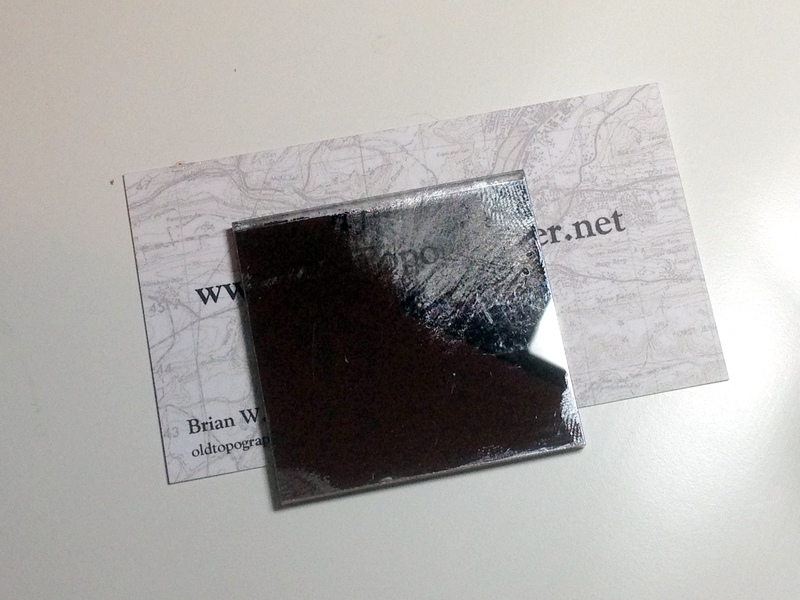 So bad, in fact, that much of the reflective coating had been scraped off of the glass backing. Because of the compact design of this stereoscope it’s difficult to imagine how this mirror got damaged. Somebody had to stick a finger up into a place that’s hard to reach and rub, rub, rub. In any other situation I would have contacted the seller and shipped the instrument back for a refund. 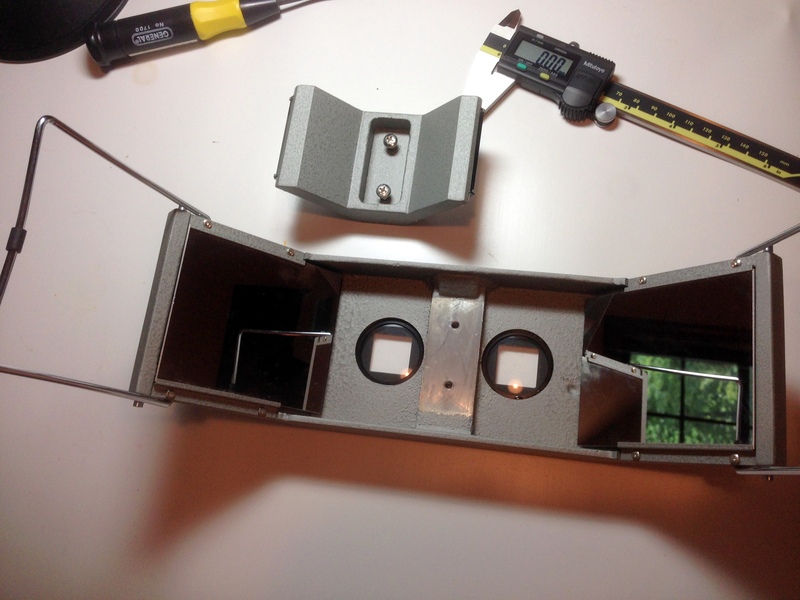 However, this stereoscope was in overall great shape and the only issue was this one small mirror. Since I didn’t have a whole lot of money invested in it I figured I’d have some replacement mirrors made. With the mirror out of the bridge we can clearly see the extent of the damage. Somebody went at the mirror with something abrasive! Careful measurement of the mirror showed that it’s 46 mm wide x 48 mm long and 3 mm thick. Next it was off to FirstSurfaceMirror.com, an on-line vendor of custom sized glass and acrylic backed first surface mirrors. A single replacement mirror would have cost me $20, but I decided to replace the pair. Buy two mirrors of the same size on the same order and you get a 15% discount on the second mirror. Two mirrors for a total of $36. Not bad. Within a week of placing the order the new mirrors were sitting in my mail box. A quick check of the dimensions shows that FirstSurfaceMirror.com did a good job with the width and length, but the thickness was just a bit off – 3.2mm (1/8″) vs. the requested 3mm, but considering they are using standard US glass it is a discrepancy I can live with as long as the new glass goes into place properly. So with the mirrors and lenses all cleaned up and everything put back together it was time for a quick check for image clarity. I was thrilled to see that this neat little instrument delivers outstanding optical performance. The stereo image was crisp edge-to-edge. It’s amazing the detail that can be gleaned from a high resolution stereo image set and a well adjusted stereoscope with clean mirrors and lenses – the features quite literally jump right out at you. 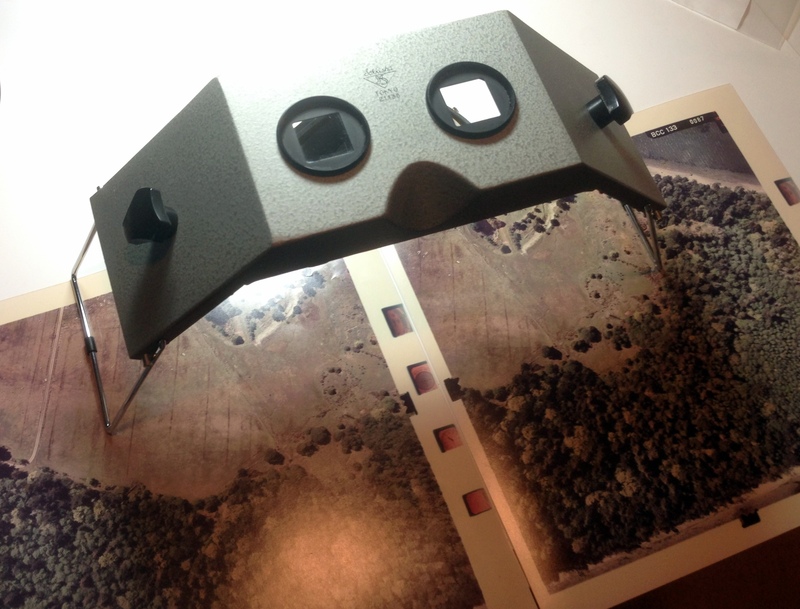 This little stereoscope delivers, and now it’s ready for another few decades of use! Mirrors do go bad with age, particularly those used in WWII-era instruments. The silvering begins to tarnish or fungus gets a foothold on the glass surface and begins to etch the surface as it grows. Even mirrors stored under ideal conditions will show the effects of simple aging. 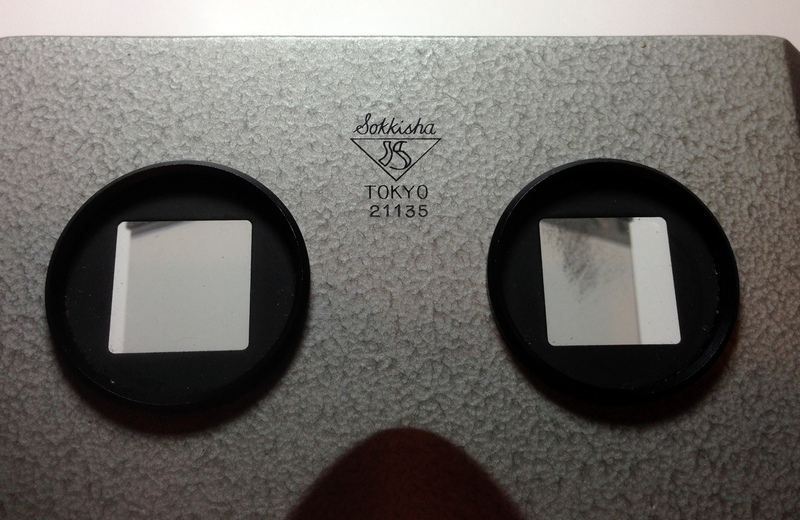 More modern (post-war) stereoscopes generally use mirrors that have a more durable aluminum reflective coating and seem to be less prone to tarnishing and other damage. Generally speaking, unless the instrument has significant historical or other collector value (rarity) most optical instruments are not worth the investment to get them restored to full working condition. 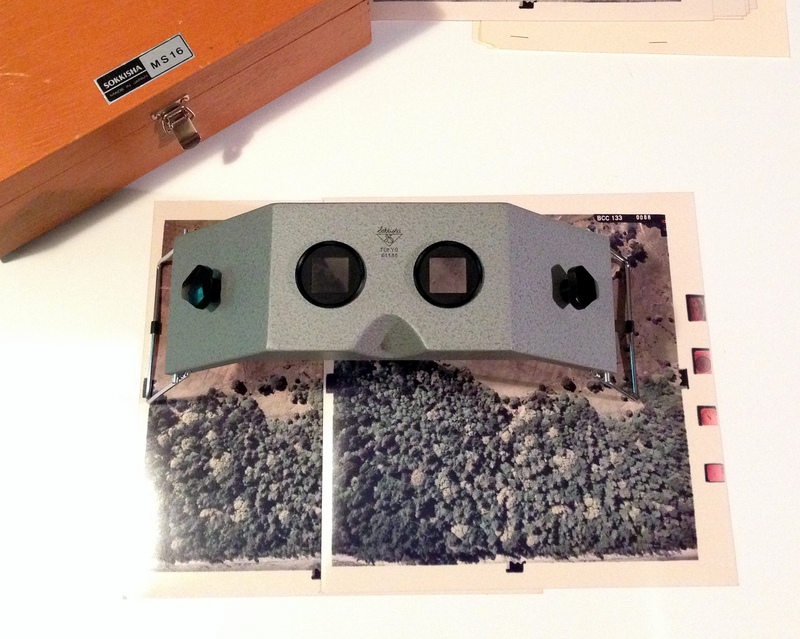 Take the Fairchild F-71 stereoscope I have in my collection as an example. It is a very common type of instrument that was manufactured by the thousands between 1942 and the 1960’s. Most F-71 stereoscopes offered for sale have seen long, hard use and have condition issues, mainly tarnished or damaged mirrors and dirty optics. 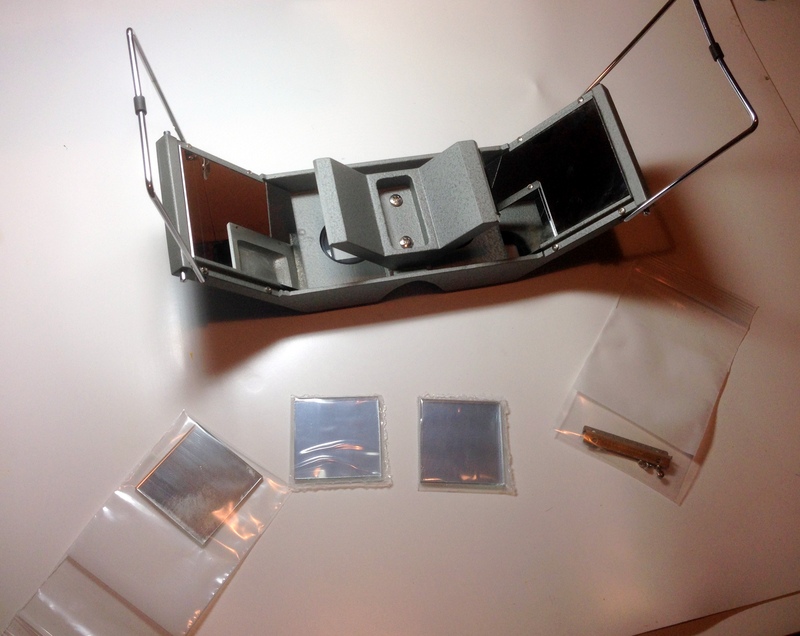 If you are looking for a good working mirror stereoscope I recommend purchasing a more recent production model from one of the Japanese manufacturers. They offer excellent quality at fairly reasonable auction prices. 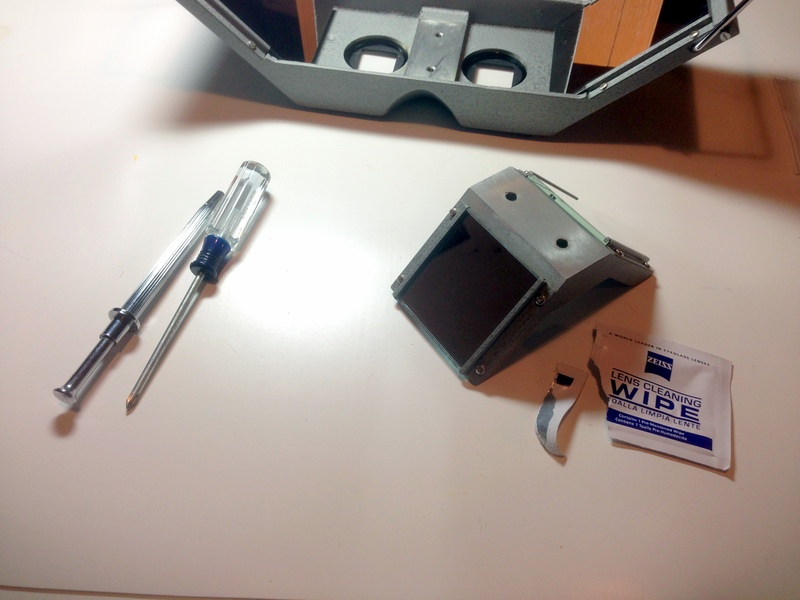 Repair or cleaning of the interior of optical systems like the binocular heads found on many mirror stereoscopes is difficult and requires special tools. 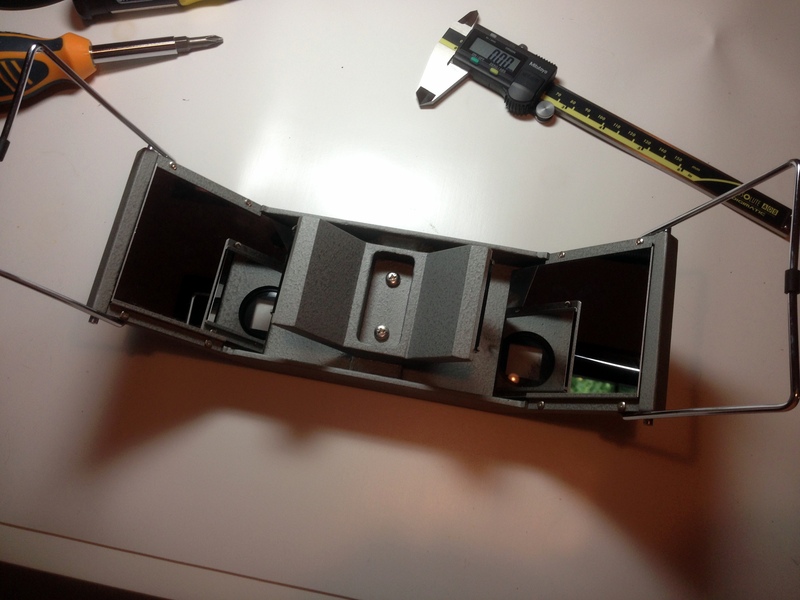 Disassembly and reassembly can be done, with some care, but re-collimating a set of binocular optics is extremely difficult without specific test equipment. Make sure you use the right cleaning materials and techniques. The old standbys, denatured alcohol, 100% cotton lint free cloths and a lens cleaning brush, are all you’ll need to do the job right. The new alcohol-free lens cleaning solutions sold in optical departments at places like Wal-Mart also work very well. Don’t use ammonia based cleaners like Windex. Start the cleaning process by gently wiping away loose dust using the lens cleaning brush. Then moisten a cloth with cleaning solution and using a light, gentle touch wipe down only those areas of the mirror that need cleaning (fingerprints, smudges, etc.). There’s usually no need to clean the entire mirror surface, just clean those areas that need it. Remember, less is best. Over-aggressive cleaning has ruined more optical instruments than neglect ever did. A set of properly fitting screwdrivers is important. One of the other things I check when evaluating instruments are the screw heads. I look for screw heads that show evidence of having been tampered with. If a screw head looks buggered up – a slotted screw head that’s been torn up or widened, or a phillips head that’s been rounded out by a poorly fitting screwdriver tip, all indicates that bubba’s been doing some repair/adjustment work on the item and more than likely messed something up. Make sure your work area is clean and well lit. Don’t do this kind of work on the same workbench you repair lawnmower engines on. And remember – keep your big, fat, greasy, sweaty fingertips off of the mirrors and optics! During the work on this stereoscope I wore latex gloves and immediately cleaned off any inadvertent marks or smudges using cleaners designed specifically for cleaning optics. So what’s next? Just for fun I may try my hand at cleaning up my Fairchild F-71 using (cheaper) acrylic-backed mirrors instead of glass. Stay tuned!